Now available for home use are high-pressure misting systems, or sometimes referred to as misting cooling systems. These units can be installed on any home completed or under construction. Our experience has been with the installation of a misting system during the custom home building process. As custom home builders, our customers at Woodridge Custom Builders LLC have expressed more interest in misting systems than in the past. A high-pressure misting cooling system compliments the Arizona outdoor lifestyle by providing a cool mist of pressurized water onto a back yard patio or dining area. The mist line is installed on the overhang and around the perimeter of a backyard patio or outdoor dining area. Specially designed mist nozzles evenly distributed throughout the high-pressure mist line produce tiny water droplets. The tiny water droplets are dispersed in a mist that cools the surrounding air temperature. This mist keeps an outdoor living space comfortable in the heat of the day. 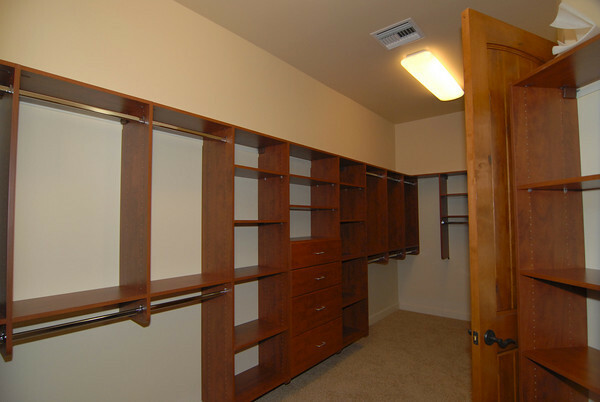 When planning and designing a custom home, the decision regarding the master closet ultimately surfaces. At Woodridge Custom Builders LLC, most of our custom homebuyers elect to have the master closet built-out by a professional closet and storage company. These custom closets create significant more storage than a dresser or chest of drawers, and frees the master bedroom of such furniture pieces. The space and organization created by a professional closet system is incredible. The number of styles and combinations are endless, stacked shelves, open shelves, shelves closed by glass doors, shelves closed by cabinet doors are shelf options alone. Rack styles are also endless; half-rack with shelves above, full-floor length racks, and two half-racks are just a few choices for hanging clothes. Including a bank of drawers creates additional options, standard drawers is one option, while sock drawers, and jewelry drawers offer specialty options. Unique storage areas for large hats, handbags, dirty laundry, and even luggage are possible. Shoes can be hidden or exposed and maximized to hold as many pairs as one desires. 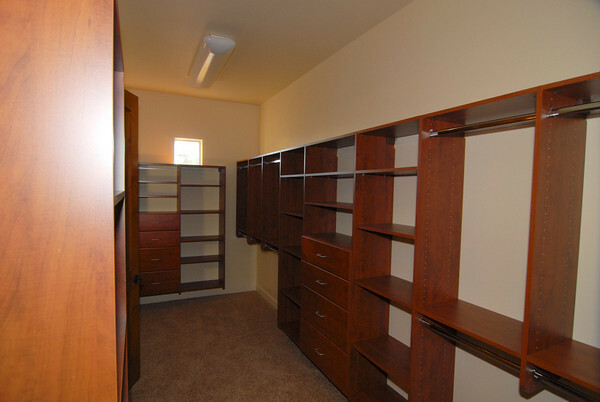 Using a professional closet and storage company can instantly double or triple storage space. Jeane Perantoni is an experienced designer at California Closets (http://www.californiaclosets.com/) and works with our custom home buyers; Jeane excels at creating space yet matching selections to the homeowners’ style. Initially understanding this benefit helps a custom homebuyer understand that the shell of a master need not be excessively large. Building-out a closet significantly adds storage space, yet it can add match any interior style as well. Most closet and storage companies offer multiple materials, fixtures, finishes and amenities that can match or complement a homeowner’s style. The finishes include cherry, alder veneer, white, oak or maple among others. These units can be installed as full-floor to ceiling or placed at a comfortable height for the homeowner. Depending on the size of the closet, an island of drawers or shelves is also possible. The photos above show the basics of a master closet build-out; in on of the custom homes built by Woodridge Custom Builders LLC, there are combinations of shelves, rack, and drawers.